AuthorMitaliPerkins: For Celebrating The Distinctives, Thank You, Booksellers! For Celebrating The Distinctives, Thank You, Booksellers! One of my favorite things about independent booksellers is your ability to celebrate the distinctive over the generic. When most people ask me where I'm from, for example, they don't really care about the details. They don't want to hear about how I was the fattest baby born in Kolkata, India. They don't want to know about being the only kid who wasn't white in my suburban North American middle school. They want a quick answer so they can slot me into a category and move along. You, however, have time, energy, and imagination for the distinctives. You care about what defines each of us as storytellers and champion stories that aren't generic. Thanks for honoring BAMBOO PEOPLE, a book featuring characters on the edges of global power and privilege. Thanks for fighting for marginalized voices, showcasing and selling stories that otherwise might not be received by readers, and cheering us on with creativity and sacrifice. I love the sense of place that defines each of you, so keep battling for the unique and rejecting the generic in your stores. We're with you all the way. A Sarah Dessen truck was giving out free whoopie pies outside the Javitz Convention Center, but sadly it was closed when I arrived at noon from Boston. 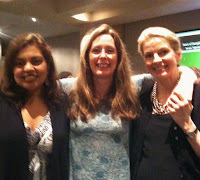 The ABA Booksellers Luncheon program was lovely, showcasing honorees and winners. David Levithan accepted his honor for WILL GRAYSON, WILL GRAYSON on behalf of himself and John Green. Laurie Halse Anderson showed us why she deserved the win in the Most Engaging Author category. After Laurie's acceptance speech, bookselling daughter Stephanie Anderson (of Word in Brooklyn) took it upon herself to keep Mom humble. From right to left: Jennifer Donnelly, who won in the YA category for REVOLUTION, Laurie Halse Anderson, and me. 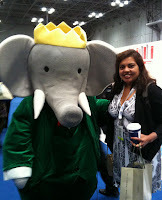 I popped into the YA Book Buzz Editors Panel before my wonderful agent Laura Rennert treated me to afternoon tea. 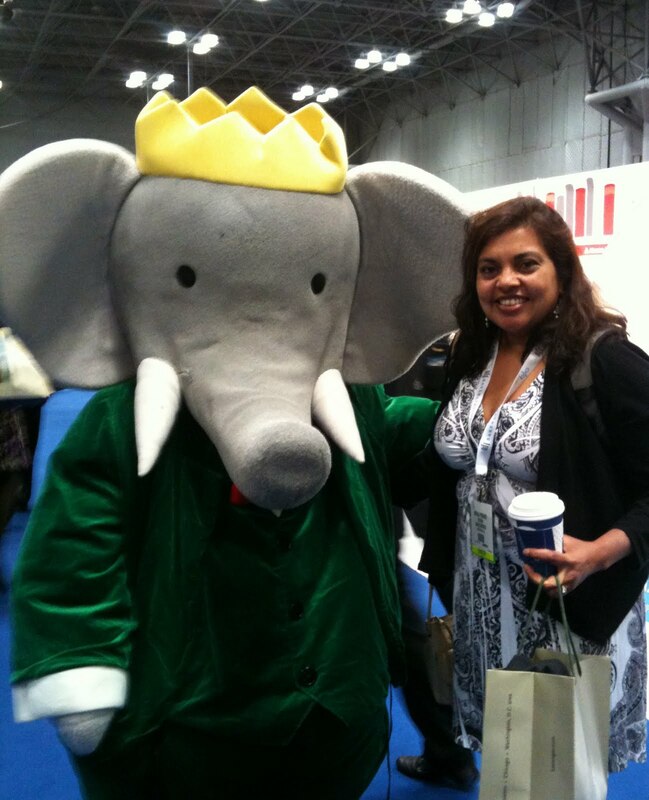 My old friend Babar sent me back to Boston after confessing a desperate longing for a shower and change of clothes. 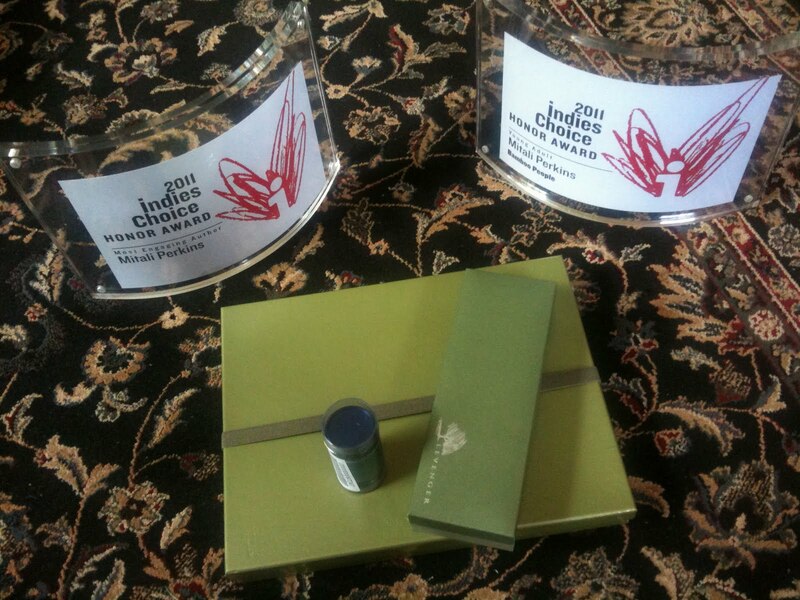 At home, I unwrapped my goodies: a gorgeous Levenger pen and notebook and two award plaques, one honoring BAMBOO PEOPLE in the YA category and one honoring me in the Most Engaging Author category. (As Lisa Yee tweeted, it's a lot better than being known as a Most Enraging Author.) Thank you, booksellers! I've loved you for years, but knowing it's not unrequited feels fabulous.